On arrival at the Airport, meet our representative, "Welcome" than transfer to hotel overnight stay at the hotel. Morning after breakfast sightseeing tour of Old Delhi including the Red fort and the Jama Masjid, post lunch tour of New Delhi to include Qutub Minar, India Gate, Humayun's tomb and the Lakshmi Narayan Temple, overnight stay at the hotel. Morning after breakfast drive to Jaipur, the fabled 'pink city' of the desert named after Jai Singh, the former Maharajah of Jaipur. On arrival at Jaipur by lunch and check in at the hotel. After Lunch and some rest visit the City Palace, the royal residence of the Maharajah of Jaipur and later visit the Observatory dating back to the 18th century and also visit the Palace of winds (Hawa Mahal). Overnight stay at the hotel. Morning after breakfast visit the majestic Amber Fort where you ride up on elephants back to the former capital of the royals set against the backdrop of wooded hills. Later explore shopping centers of Jaipur and drive to Pushkar. On arrival at Pushkar check in at the hotel. Overnight stay at the hotel. Morning after breakfast, full day sightseeing of Pushkar. Overnight stay at the hotel. Morning after breakfast drive to Udaipur (the Venice of the east). Arrive Udaipur in the evening and check in at the hotel overnight stay. Morning after Breakfast make a visit to the City Palace built in 1725 and later visit Sahelion ki Bari, the gardens the maids-of-honor. After lunch make a trip to Nagda and Eklingji to see the beautiful temples in their ruins. Overnight stay at the hotel. Morning after breakfast, drive to the only hill resort of Rajasthan Mt. Abu enroute visiting the famous Jain temples of Ranakpur. On arrival Mt. Abu check in at the hotel. Evening free for leisure. Overnight stay at the hotel. Morning after breakfast, at leisure to enjoy the scenic beauty of this hill station. After lunch drive to Jodhpur. On arrival at Jodhpur check in at the hotel, overnight stay. Morning after breakfast, Start the city tour of Jodhpur visiting the Mehrangarh Fort museum and Jaswant Thada, the cremation spot of the royal family. After lunch visit the ancient capital of Marwar-Mandore. Overnight stay at the hotel. Morning after breakfast, drive to Jaisalmer situated deep in the heart of the Thar Desert. Arrive Jaisalmer and shortly after lunch visit the Chhatris of Maharwals and later Camel ride at Sam for sunset. Overnight stay. Morning after breakfast, drive to Bikaner and arrive by lunch. After lunch make a tour of Junagarh Fort and its fabulous palaces. Overnight stay at the hotel. Morning after breakfast transfer to Mandawa (an old castle in Rajasthan). Post lunch session includes a small visit of Mandawa to appreciate the painted Havelis on the ancient and the famous silk route. Overnight stay at the hotel. Morning after breakfast, drive to Bharatpur (famous for keoladeo Ghana bird sanctuary). Evening make a visit to the sanctuary. Overnight stay at the hotel. Early morning make a visit to the sanctuary to see the birds in their natural habitat. After breakfast drive down to Agra (The city of Taj Mahal). Arrive Agra by lunch after a tour of the beautiful city of Fatehpur Sikri, the Old capital of Mughal emperor Akbar. Post lunch tour of the world famous Tajmahal and of the Red Fort. Later explore the shopping centers of Agra. Overnight stay at the hotel. Morning at leisure. Afternoon transfer to Delhi domestic airport time to catch the flight for Chennai. Arrive Chennai in the evening, check in at the hotel overnight stay. Morning after breakfast, Full day city tour of Chennai including the Snake park and Kapaleeswara Temple dedicated to Lord Shiva and the Museum. Morning after breakfast, drive to Tanjore on arrival check in at the hotel. Evening for leisure, overnight stay at the hotel. Morning after breakfast, start the tour for Tanjore visiting the Brihadeshwara Temple, a typical architecture from the 11th century. Later visit the Saraswati Mahal Library. After lunch depart for Madurai on arrival in the evening and transfer to your hotel. Overnight stay at the hotel. Morning after breakfast, visit the world famous Meenakshi Sundereshwara Temple, a huge Dravidian temple complex. After lunch depart for Periyar wild life sanctuary. Arrive Periyar in the evening and check in at the hotel, overnight stay. Morning boat cruise on the lake to get a closer look at the wild elephants. Later drive to reach the small beautiful town of Alleppey situated on the backwaters of Kerala, overnight stay. Morning after breakfast, boat cruise on the backwaters of Kerala (three hours from boat) and than continue by Road to Cochin. Arrive Cochin and visit the Chinese fishing nets in the backwaters of Cochin. Overnight stay at boat. Morning after breakfast, Sea Boat Ride To Visit Various Islands And Churches, Santa Cruz Basilica, Mattancherry Palace, Jewish synagogue, Dutch palace, St. Franchis. Overnight at boat. Morning after breakfast drive to Coimbatore, also called the 'Manchester of South India, on arrive Coimbatore check in at the hotel, after lunch visit the Maruthamalai temple, Overnight stay at the hotel. Morning after breakfast, drive to the queen of hill stations, Ooty known for its salubrious climate and scenic beauty. On arrival check in at the hotel, rest of day for leisure. Morning after breakfast, depart for Mysore (wonderful historic town and evidence city to exhibit the oldest Indian richest economy). On arrival Mysore check in at the hotel, than visit the Mysore Palace, once the capital seat of power of the ruling Wodeyars. Also visit the Brindavan Garden, Chamundeeswri temple, Tipu's summer palace. Overnight stay at the hotel. Morning after breakfast, drive to Belur, the superbly preserved Chennkesava Temple here is a tribute to the skill and genius of the medieval craftsman. Later visit Halebid temple 10 km. From Belur, a riot of carvings left incomplete after 80 years of labor, Overnight stay at the hotel. Morning after breakfast, drive to Bangalore on arrival Bangalore, transfer to the airport, time to catch the flight for Mumbai. Arrive Mumbai in the evening, meet our representative and transfer to the hotel. Morning after breakfast proceed for a half day city tour of Mumbai visiting Kamla Nehru park, Hanging gardens situated on the slopes of Malabar hill offering a panoramic view of Marine Drive and Chawpatty beach, Prince of wales museum, Mani Bhawan, Dhobi Ghat, Gateway of India and drive through the Crawford market. Evening Transfer to international Airport time to catch the flight for onward destination. Delhi Birding at Okhala bridge, Red Fort, Jama Masjid, India Gate, Raj Ghat. Jaipur Birding in Jaigarh. Excursion City Palace, Hawa Mahal, Jal Mahal, Amer Fort. Pushkar Birding Near Pushkar, Excursion, Pushkar Lake, Brahma Temple. Udaipur City Palace, Saheliyon ki Bari, Birding around Udaipur. Mount Abu Birding around Sunrise point, Excursion Delawara Temple, Nakki lake. Jodhpur Meharangarh Fort, birding around Jodhpur. Jaisalmer Camel Ride in Sam. Bikaner Junagarh Fort. 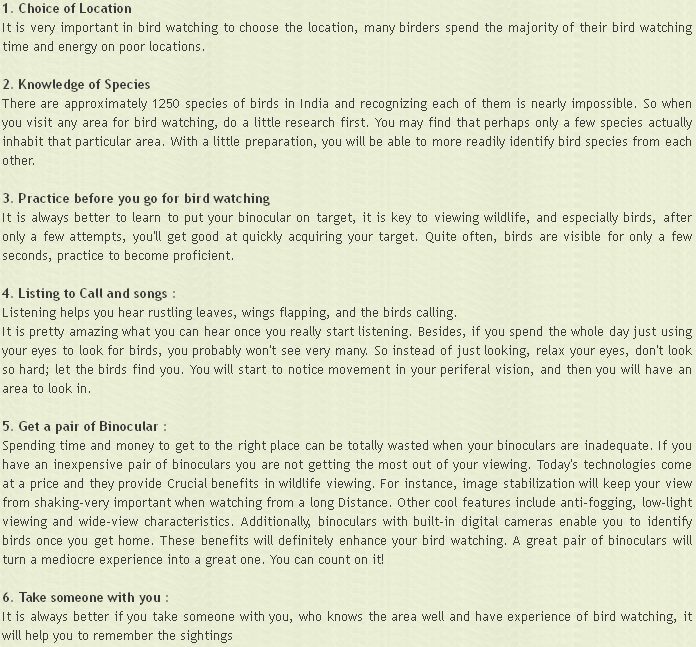 Birding Around Bikaner. Bhartpur Birding by boat, and Rickshaw Ride. See the Migratory birds. Chennai City Tour, see Snake park and Kapaleeswara Temple dedicated to Lord Shiva and the Museum. Tanjore Tour for Tanjore, Brihadeshwara Temple, Saraswati Mahal Library. Madurai Meenakshi Sundereshwara Temple, a huge Dravidian temple complex. Periyar Birding by Boat Cruise in Periyar Lake. Cochin Sea Boat Ride To Visit Various Islands And Churches, Santa Cruz Basilica, Mattancherry Palace, Jewish synagogue, Dutch palace, St. Franchis. Ooty Birding around Nilgiri’s Hill. Helebid Chennkesava Temple, medieval craftsman. Halebid temple.